A New York City firefighter, a singing English teacher, a blunt-talking steelworker and a Vegas showgirl were squished into a massive rowboat in the Pacific Ocean with more than a dozen other people. Their destination: Palau Island. When a spindly older woman stood up at the helm and belted out what could have been a Survivor show tune, it became clear "Survivor: Palau" would be a season of outstanding personalities. In its 10th season, the Survivor series seemed to be looking for a way to break the mold, and several twists provided by host Jeff Probst — and a crew of dynamic castaways — did just that. In an early twist, three contestants were eliminated in the first show, including the season's two most vocal women. Probst presented the first challenge to the boat of 20 before the contestants had set foot on the island that would be their home for 39 days. It was a race for the sand. More than a mile off shore, each member of the group faced a decision: to dive or to row. The virtue of patience held each crewmember in their seat … until Wanda Shirk, the 55-year-old English teacher from Ulysses, Pa., stood up and commenced singing. "I've written a bunch of songs for Survivor," she said later on camera. "I'm all about this being a party as long as it lasts." It didn't last long for Wanda. Her antics continued as Stephenie LaGrossa and Jonathan Libby (both 20-something sales representatives) abandoned ship to race the boat by swimming to shore. Wanda and the boat left them behind, but it wasn't long before everyone hit the waves, trying to reach shore — and immunity — first. 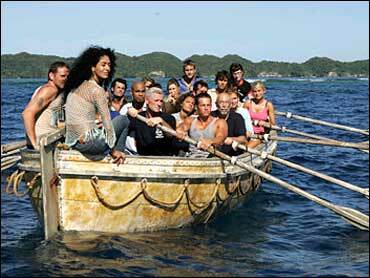 The contestants barely got a chance to acclimate to their new island home when Probst showed up to stir things up. He said the immunity newly earned by Jolanda Jones and Ian Rosenberger would last just 10 minutes as he orchestrated them as the captains in the ultimate game of elementary-school team-picking. And, like every time teams are chosen through elimination, some feelings were hurt. Angie Jakusz, a bespectacled watercolor painter born in Waukesha, Wisc., and Coby Archa, a hairdresser from Texas, made friends as fellow self-described outcasts. But when it came time for Coby to choose a female left in the dwindling pool of team candidates, he left Angie standing there. Angie was picked last, and despite her tough, tattooed façade, she said several times that the pain stuck — at least until the end of the episode. As the pool became two teams, and Wanda and Jonathan were effectively voted off through the game of elimination. Wanda sang a goodbye tune as she sailed off in her white nightslip on the going away boat. The first challenge pitted the teams against each other for team immunity. The contestants all tumbled through a course, before facing the decision of whether to weigh themselves down with heavy containers of food, water and flint to make fire. Team Ulong lagged behind, trying to keep their food and water with them. Meanwhile, Koror, which only took fire with them, mastered the canoe easily, coordinating their strokes in order to reach the flag, and win team immunity. With the immunity token (something of a wooden monkey), team Koror was presented with an option. Because the two teams would no longer be living on the same beach, they could choose their new home. Would they prefer to stay on the beach they knew already, with the shelter they helped build and the supplies they had already gathered, Jeff asked, or take a map to a different beach? Tom Westman, the steel-haired NYC firefighter, sprung on the opportunity, saying he'd prefer a fresh adventure. Koror set off for their new home in their canoe, only to be struck by a wave and have their canoe capsized. Supplies for fire were now underneath leagues of water. On Ulong's old home beach, alliance making started early. It became a morality play of personalities: the strongest, most extroverted Jolanda versus the most sensitive and introverted, Angie. An early alliance showed Jolanda's strength, as she urged others to keep the men and, hence, nix Angie. But a stroll through the jungle sans Jolanda brought out several contestants' animosities toward Jolanda's overwhelming personality. One person asked "Angie, are you in?" "Of course!" she said, telling the camera, "Don't you think I remember I was picked last?" But when the votes came in, five votes against Jolanda were tallied. She left silently. Reflecting on the vote, Jolanda said, "I am the oldest and I think differently than my tribe. It's an experience I think everyone should try." Tune in to Friday's CBS Early Show to get more of Jolanda's reaction. Meet Jeff, who was also eliminated, and Wanda is sure to have another Survivor song in her repertoire.